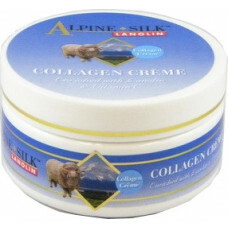 Alpine Silk collagen creme combines Collagen, natural Lanolin and Vitamin E to moisturize, promote skin elasticity and smooth wrinkles for a revitalized complexion. 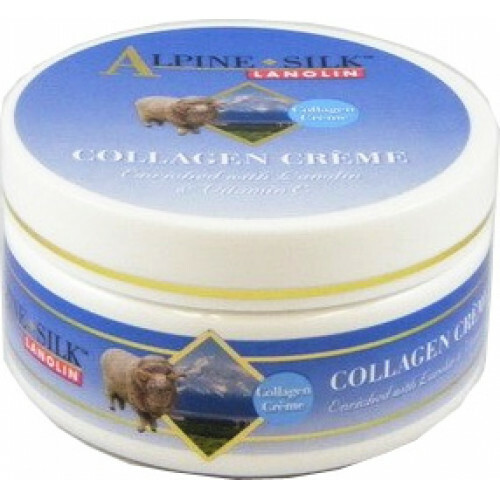 Collagen is a natural protein that keeps the skin firm and supple. It provides the skin with flexibility and resilience, helping prevent wrinkles. Gently apply to face, neck and body. Water, Mineral Oil, Glycerin, Glyceryl Stearate, Acetylated Lanolin Alcohols, Lanolin, Cetyl Alcohol, Isopropyl Myristate, Polysorbate 60, PEG-100, Stearate, Hydrolysed Collagen, Phenoxyethanol, Tocopheryl Acetate (Vitamin E), Diazolidinyl Urea, Methyl Paraben and Propyl Paraben and Ethyl Paraben and Butyl Paraben, Fragrance.